Ask The Ripped Dude: What's The Best Way To Do Cardio? The best way to do cardio explained by Obi Obadike. I can't do another hour on the treadmill. There has to be a better way to do cardio. What's your advice, Ripped Dude? Why train and do cardio for an hour or two when you can get a great workout in 30 minutes? By implementing sprints into your weekly cardio routine, you get twice the benefits in half the time. I know, I know. You're probably tired of hearing me preach about how great sprinting is, but the benefits are so incredible, I'll never stop talking about it. I know that my lean physique is a byproduct of all the years I spent as a college-level sprinter. 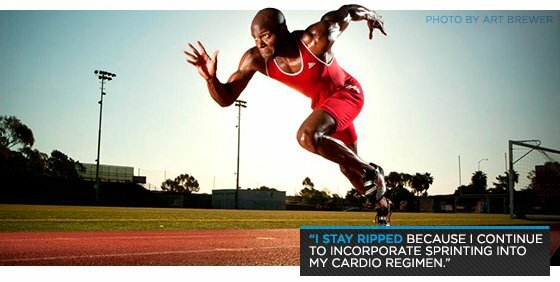 I stay ripped because I continue to incorporate sprinting into my cardio regimen. Yes, you burn a lot of calories while you're sprinting, but you also burn a lot of calories after you're done. This magical effect is known as EPOC. After you train, your body works hard to return to its normal state. Your body requires energy to restore blood lactate levels, normalize blood temperature, and bring the heart rate down. The harder you work the more disorder you bring to these systems. Your body then has to work harder to bring them back to normal. All that energy requires calories. Burning calories leads to a leaner body. Adenosine triphosphate (ATP) is your body's most basic energy currency. When muscles contract, they spend ATP as energy. To continue moving, your muscles require more and more ATP. Not only does your body need to produce it, but it also must replace it. If you sprint, your hamstrings and glutes must use it and reproduce it at a fast rate. If you run out of ATP, you reach failure. Sprints help your body grow efficient at using and producing ATP. This means you'll be able to recover more quickly and train for longer before reaching fatigue. 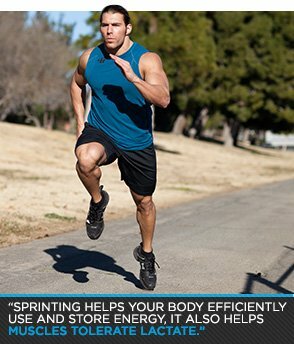 Sprinting makes your body more efficient at using and storing energy, and it also helps your muscles tolerate lactate. Strenuous aerobic activity produces lactate, and lactate can cause pain and fatigue. So there's value in developing tolerance. During high-intensity activity, a chemical process called "buffering" reduces the acidity of your muscle fibers. Sprint regularly and your body gets better at buffering lactate. Less lactate means less fatigue. If you're not tired, you get to spend more time on the track being awesome! I hope I've convinced you. Now, you need a great sprint workout to reap all those crazy benefits. Warm up and stretch for 15-20 minutes before you begin sprinting. This workout isn't going to be easy, but it is an incredible cardio workout that will burn a lot of calories. I do this workout three days per week, usually Monday, Wednesday, and Friday. After each sprint, walk back to the starting line. After you walk back, begin the next step of the ladder. Run at about 70 percent speed. After 5 minutes of rest, begin the second ladder.